Over the Chilkoot Trails icy steps, these sons of Viches cameStepovich, Butrovich, Dapcevich, Begich, Paskvan, and Peratrovichto guide Alaska from a raw land to statehood, from southeast to the arctic, from gold camps to the forty-ninth star! Names so Alaskan that their Slavic stories went untold, they represented the worlds former empires and todays Balkan states and shaped all of Alaska. 404 pages with maps, timeline, and historic photos on every page. Bridges includes the building of the Alaska Highway, bringing communication to the Great Land, and the Alaska state constitutional convention. Judy has also included a contrast to the Great Land, her lifelong history with the former Yugoslavia, presented through her friends, the people of the Balkans. 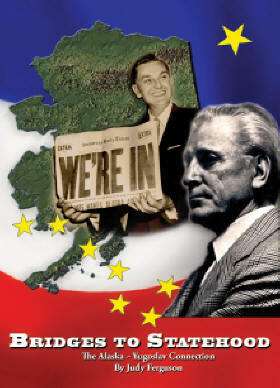 This is a book celebrating Alaskas fiftieth anniversary of statehood and told by the talented immigrants who shaped Alaska. Bridges to Statehood, The Alaska-Yugoslav Connection, is a window through which one can see how life was for immigrants to Alaska over more than a hundred years ago. Wallace M. Olson, Professor of Anthropology (Emeritus), University of Alaska Southeast. Bridges is also available with the introductory DVD, The Shaping of a State. High school lesson plans are available on CD. Todays U.S. 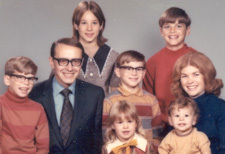 Senator Mark Begich with his father, the late US Congressman Nick Begich and family, 1970. FAIRBANKS -- When you think “Alaska,” chances are the term “Yugoslavian immigrants” isn’t the first thing that springs to mind. But before you dismiss the idea, take a drive down Yankovich Road, tour the Butrovich Building on the University of Alaska Fairbanks campus, or buy a chainsaw from Jackovich Supply. Or for that matter, take a glimpse at state and local politics where you’ll find Mark Begich, Joe Paskvan and Leslie Hajdukovich. Those names, all of which have been found in Alaska for many years, had to come from somewhere. And it certainly wasn’t Merry Olde England. Judy Ferguson, who definitely qualifies as one of Alaska’s most indefatigable historians, has done considerable research into our state’s Balkan connection, often covering the topic in her columns for this paper and the Anchorage Daily News. In the process she became a frequent visitor to that tragic corner of Europe, witnessing first hand the ravages that decades of communist rule followed by years of civil warfare brought down on a people with a rich cultural tapestry and a long and tumultuous history. Ferguson’s exhaustive research has left her with two stories to tell, and both find their way into her latest book, “Bridges to Statehood: The Alaska-Yugoslavia Connection.” It’s essentially two books in one cover. In the first two thirds or so she collects and expands on many of the essays she’s published over the last decade documenting the tremendous impact Yugoslavian immigrants have had on Alaska’s development, while in the final third she offers a deeply moving memoir of her own experiences traveling through the former republics of Yugoslavia and the people she has grown close to there. Yugoslavia was cobbled together after World War I from an assortment of neighboring regions that had most previously been controlled by the Austro-Hungarian Empire. In its less than one century-long existence, the country was beset by poverty and strife, brutally overrun by the Nazis, and rigidly controlled by the communists, before finally imploding after the fall of the Berlin Wall. It’s understandable, then, why many Yugoslavs left. Quite a few of them stole their way to America, and many of those headed north to Alaska, working in mining, opening bars and diving into the territory’s politics. 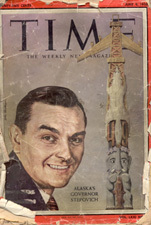 Ferguson paints a picture of a tight-knit community of Balkan immigrants and their children who quickly asserted themselves throughout Alaska, particularly in Fairbanks, where they dominated the business and political culture at mid-century. Ferguson specializes in narrative histories. She interviews aging Alaskans and the children and grandchildren of our pioneers and lets them tell their own stories with minimal interference. We meet plenty of longtime Alaskans here, including the Miscovich family, miners whose lives redefine the word “gumption;” Mike Stepovich, the son of an immigrant and Alaska’s last territorial governor; and Paul Gavora, who fled the Soviet occupation of Eastern Europe and became a Fairbanks grocery magnate. 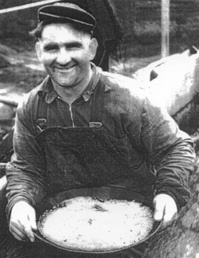 In my personal favorite interview, the late Bobby Miller — whose roots go back to Slovenia — tells of his experiences starting from age 5 when he began hustling, shoveling, and driving his way into every likely opportunity, playing a role in the development of Alaska aviation, operating Alaska’s first diesel-powered bulldozer, founding Miller Salvage, and purchasing Circle Hot Springs, among numerous other pursuits. It’s a great story that will leave the readers wondering what they’ve done with their time. Ferguson, who treats all of her subjects with tremendous dignity, makes readers feel as if they had personally met these people, and she does likewise when she shifts to her own experiences in Yugoslavia over the last decade, introducing us to her many friends there. Ferguson had met several Yugoslavs while participating in a European college program in the 1960s. 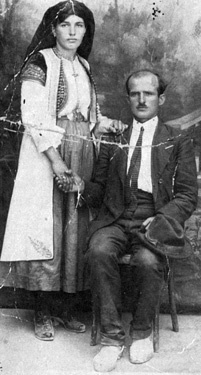 Decades later the Balkan wars broke out while she was researching the Yugoslavian connection with Alaska, prompting her to renew contact with her old friends. This led to her traveling to the region during some of its darkest times, developing close personal connections with the people there and a need to share their stories. Ferguson’s insight into the maelstrom that consumed the Balkans in the 1990s, coupled with her vivid portraits of her acquaintances who weathered the violence that overwhelmed the region, shed considerable light on a war most Americans didn’t understand. By telling the stories of those caught in the crossfire, she humanizes a war that for many of us primarily consisted of bombs being dropped from a safe altitude. Without climbing on a soapbox she nonetheless manages to present serious challenges to the moral clarity NATO used to justify the attacks on Belgrade and elsewhere. And while she never gives Slobodan Milosevic an inch, she does offer a sympathetic view of the Serbs themselves, one that contrasts markedly with the way they were widely portrayed during the war. All of this is important, far too important to be buried in the back of an Alaska history book that most people with an interest in the Balkan conflict will never pick up. The market for Alaska books is mostly regional, while the potential audience for a book about the Yugoslavian wars is potentially much larger. And Ferguson’s work in this area is original and deserves broad notice. So it would be nice if she considered reissuing the memoir section of her book as a stand-alone title so that it might find its way into more hands. Meanwhile, “Bridges to Statehood” remains worthy of the time spent reading it. It’s a hefty book, nearly encyclopedic in length, but there’s very little filler. Jam-packed with history, lavishly illustrated with hundreds of photos and intimate in its portrayals of people, it serves as a bridge between two parts of the world that, though far from each other geographically, are more closely tied than most of us realize. Judy Ferguson will be signing copies of “Bridges to Statehood” from 2-5 p.m. May 16 at Gulliver’s Books, from 5-8 p.m. June 5 at Bob Eley’s Fairbanks Community Museum and from 2-5 p.m. June 6 at Barnes & Noble. 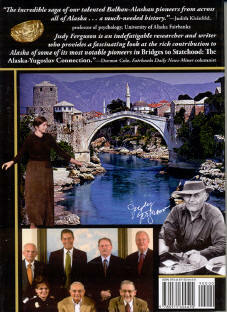 Publisher and Distributor information: ISBN 978-0-9716044-9-0, Bridges to Statehood, the Alaska-Yugoslav Connection distributed by Voice of Alaska Publishing and by News Group.